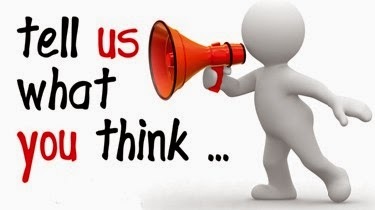 Like already mentioned in the newsletter; WE has few surprises in pipeline for you. The time has come to announce one of the surprises. WE has been contemplating the idea of a Print Magazine for quite some time now. WE took our time to decide with a calm mind and do our research. Going into traditional print magazine would mean following many norms and procedures as prescribed by the Government of India, involving Regional Magistrate Court & Registrar of Newspapers for India, etc. In short it is tedious and lengthy procedure WE is not sure of dealing with, at this point of time. Namrata and I decided to keep it aside for consideration in future. Finally, WE decided to (self)publish a Print Magazine of the past six issues April 2014 to September 2014 for private circulation. After the decision was made the work on compilation and formatting began. And now, since the cover design has been finalized and I have finished the compiling and formatting we proudly announce our first Print Magazine. The Magazine would be available on the platform of Pothi.com. (for private circulation only) WE believes in transparency. So, we want you to know that Namrata and I have decided to keep a minimal margin of profit behind the sales of the print magazine, which again would be used in future for giving gift vouchers to contest winners. Since almost everyone knows that WE is a non-profit-making online magazine, i.e. WE does not allow advertisements on the site and whatever the investments are, Namrata and I share equally - like the awards WE gives, it is impossible for us to bear the extra cost of giving free copies. WE can however give away a few early bird copies for discounted price. (Details would be announced later) WE is thankful to the contributors and readers for their immense love, strong support and unwavering faith. 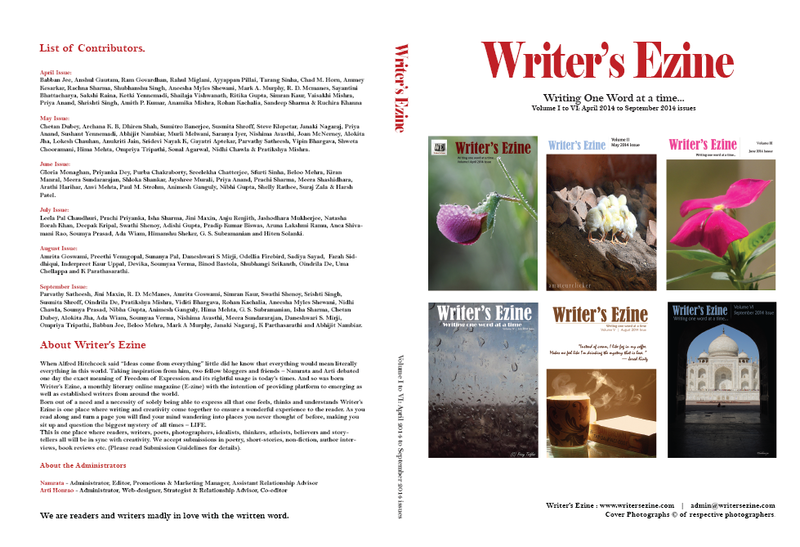 WE requests you to continue giving us your support and spread the word about Writer's Ezine and show your interest in the print magazine and encourage your friends to join in. Chetan Dubey, Archana K. B, Dhiren Shah, Sumitro Banerjee, Susmita Shroff, Steve Klepetar, Janaki Nagaraj, Priya Anand, Sushant Yennemadi, Usha Narayanan, Abhijit Nambiar, Murli Melwani, Saranya Iyer, Nishima Avasthi, Joan McNerney, Alokita Jha, Lokesh Chauhan, Anukriti Jain, Sridevi Nayak K, Gayatri Aptekar, Parvathy, Vipin Bhargava, Shweta Chooramani, Hima Mehta, Ompriya Tripathi, Sonal Agrawal, Nidhi Chawla & Pratikshya Mishra. Gloria Monaghan, Priyanka Dey, Purba Chakraborty, Sreelekha Chatterjee, Sfurti Sinha, Beloo Mehra, Kiran Manral, Meera Sundararajan, Shloka Shankar, Jayshree Murali, Priya Anand, Prachi Sharma, Meera Shashidhara, Arathi Harihar, Anvi Mehta, Paul M. Strohm, Animesh Ganguly, Nibha Gupta, Shelly Rathee, Suraj Zala & Harsh Patel. Leela Pal Chaudhuri, Prachi Priyanka, Isha Sharma, Jini Maxin, Anju Renjith, Jashodhara Mukherjee, Natasha Borah Khan, Deepak Kripal, Swathi Shenoy, Adishi Gupta, Pradip Kumar Biswas, Aruna Lakshmi Ramu, Anca Mihaela Bruma, Nelton D’Souza, Archana Shivamani Rao, Soumya Prasad, Ada Wiam, Himanshu Shekher, G. S. Subramanian and Hiten Solanki. Amrita Goswami, Preethi Venugopal, Sunanya Pal, Daneshwari S Mirji, Odellia Firebird, Sadiya Sayad, Farah Siddiqui, Zeenat Mahal, Inderpreet Kaur Uppal, Devika, Soumyaa Verma, Nidhi Saxsena, Binod Bastola, Shubhangi Srikanth, Oindrila De, Uma Chellappa and K Parathasarathi. Parvathy, Jini Maxin, R. D. McManes, Amrita Goswami, Simran Kaur, Swathi Shenoy, Srishti Singh, Susmita Shroff, Oindrila De, Farah Siddiqui, Pratikshya Mishra, Viditi Bhargava, Rohan Kachalia, Aneesha Myles Shewani, Nidhi Chawla, Soumya Prasad, Nibha Gupta, Animesh Ganguly, Hima Mehta, G. S. Subramanian, Isha Sharma, Chetan Dubey, Alokita Jha, Ada Wiam, Soumyaa Verma, Nishima Avasthi, Meera Sundararajan, Purba Chakraborty, Daneshwari S. Mirji, Ompriya Tripathi, Babban Jee, Beloo Mehra, Mark A Murphy, Janaki Nagaraj, K Parthasarathi and Abhijit Nambiar.